As much as I would love for my children to gain more independence, maybe I’ve given them just enough so far. Maybe I’m not ready to give them more. As a kid, I would walk or ride my bike to a friend’s house and ask her to play. I would ring the doorbell, only to find no one home, go to the next house, and so on until I found someone. And even then, we usually hopped on our bikes and took off to somewhere unplanned. I remember discovering a construction site half a mile from my house and running around it with friends. I can’t think of any friend of mine who would accept this today. It truly is a different world. Perhaps it’s partly due to the area I live in, hilly, windy, and spread out, but I can’t imagine the above scenario taking place. Just yesterday, I attempted to take a walk around my neighborhood. I told my son he could ride his bike alongside me, but once he started getting ahead of me, I nixed the entire idea. A car clearly could not see him around the bend. As much as I wanted to give him some independence and even encourage him to ride his bike on his own, I’m realizing this can’t happen where I live. Luckily, we live on a cul-de-sac and he hasn’t complained about going around and around in circles . . . yet. That and the many bike trails around here should keep him happy for a while. In my town, most kids get a cell phone at their fifth-grade graduation, primarily so their parents can keep tabs on them. I’m sure I will do the same, however, the eleven-year-old me would be in hysterics. “Don’t you trust me?” I would scream as I left to ride two miles to a friend’s house. In our techie world where we expect instant replies to emails and texts, we also expect to know where our children’s whereabouts every minute of the day. Google “helicopter parents” and “college kids” and you will see that even then, independence can be limited. Yes, there are moms who call their almost adult children’s professors to complain about grades. I took baby steps yesterday on the road to independence. My five-year-old wanted milk. I told her to grab it out of the refrigerator, but she couldn’t reach. I asked her to get a cup from the cabinet, but of course, she couldn’t reach again. I told her to pour the milk. She did and spilled it all over the table, floor, and herself. The “me” from 18 days ago may have yelled. The “me” of today wiped it up without comment and encouraged her to try again next time. For a useful link about encouraging appropriate independence in your child, here to read a blog post I found. Today, my children both (FINALLY!) started camp. For the next five weeks, I will have more time to myself than I have had since October 2008. Which brings me to the challenge . . .
Just as “good job” communicates very little to your child. 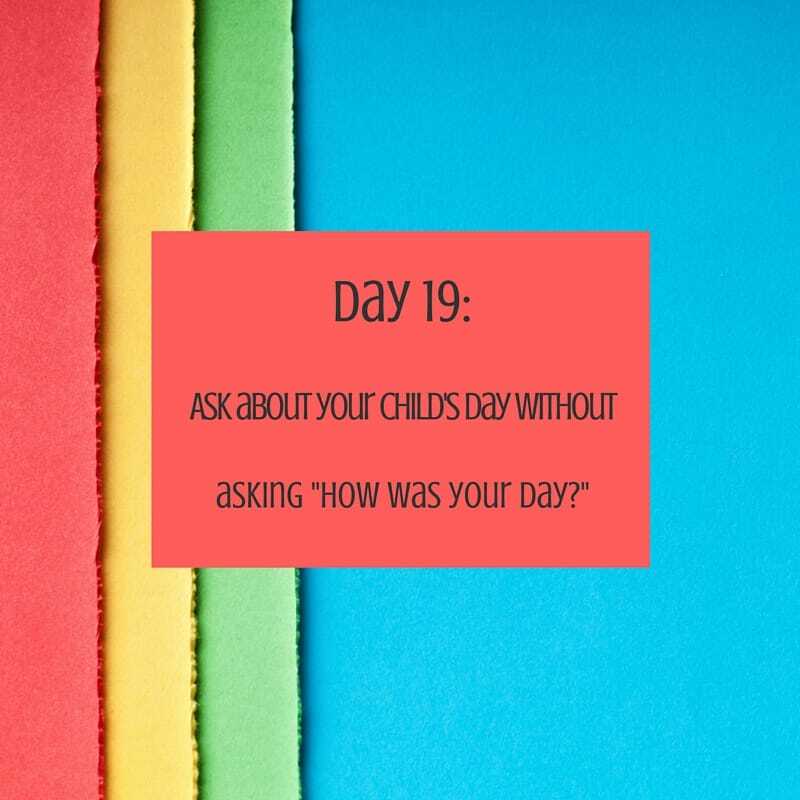 “How was your day?” will often get you very little information. What’s my son’s usual response? “Good.” Umm, that answer lacks the major details I crave. What if I never asked that question at all? How much more could I learn by asking the right questions? Join me in compiling a list of alternative questions.